"Thonet armchair S 411, nappa leather"
The outstanding features of this armchair are elegance, timelessness and high seating comfort on nappa leather and casual comfort upholstery. In addition, there is an ease with which only one free-swinging model is available. While the first chairs made of steel pipes from the 1920s were hardly provided with upholstery, the Thonet catalog of 1935 already features a series of voluminously cushioned armchairs and sofas. The S 411 is a free-standing chair with a round tube frame (25x2mm). The seat is equipped with a spring core padding and rests on a wooden construction. The armrests are milled, ground and pickled. An optional ottoman is available as an option. It is the distinctive and personal unique pieces which adapt themselves to their environment through intensive use. This can be the leather bag, the favorite jacket or just a used furniture on which we leave our traces. The term "Pure Materials" includes this idea. Traces of use are deliberately visible and give each piece of furniture its unmistakable identity. The gentle handling of nature is of great importance in the production of "Pure Materials" products. ... in best quality gives the furniture warmth, value and longevity. It adapts to the body temperature quickly and is cuddly and soft. Each skin has special characteristics and is unique. In the tanning and dyeing process, these differences are compared as far as possible. With the right care it develops a beautiful patina over time and guarantees joy of the furniture. Therefore the leather should be dusted with a damp cloth. Ballpoint pen strokes or small stains can be removed with a colourless eraser. Liquids should always be removed immediately. Polish them with a soft cloth. Then wipe it with a damp cloth. A mild soapy solution and distilled water are suitable for the care. 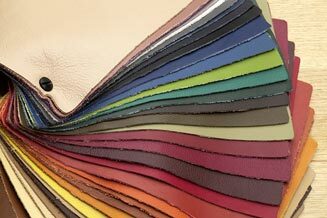 A leather care should be carried out at larger intervals. Avoid aggressive products such as abrasive cleaners, stain remover, turpentine, wax, solvents or shoe polish. Strong sunlight can change the colour. Especially the colour white is sensitive. This is not a defect, but is due to the reaction of the natural leather product. In the 1920s and 1930s, the development of furniture made of steel tubing was a milestone in the history of modern furniture. Their open, clear and simple form was contemporary and adapted extremely well to the actual architecture of this time. It is the embodiment of a whole style of furnishing. Restraint, transparency and functionality were all steel tube designs that were created at the time. Cantilevers are the most important invention. The legless chair is probably one of the most important innovations of furniture design in the 20th century. 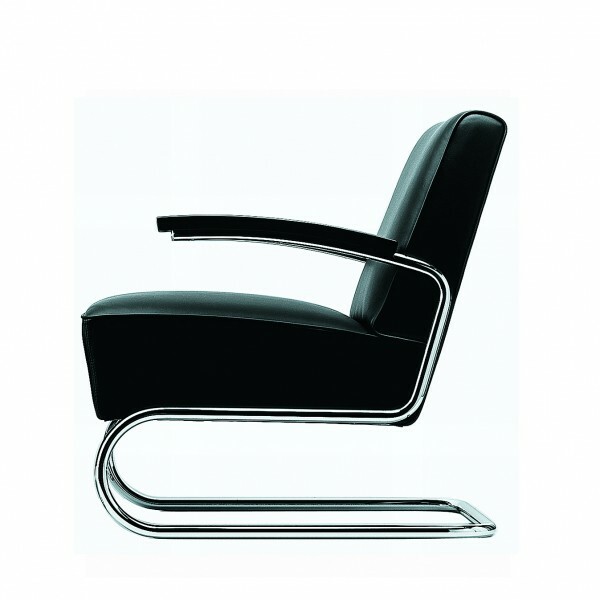 Already in the thirties Thonet, with its interest for this technology, rose to the largest producer worldwide. Architects and designers from the Bauhaus environment gave the furniture its shape, but also numerous work designs were an important part of this collection. In 1919 Walter Gropius called for the unification of technology and art into one unity. 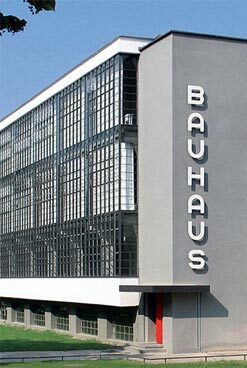 The Bauhaus is undoubtedly one of the most important stations in the history of modern design and architecture. In 1926 the Bauhaus moved to Dessau, where at that time the new material steel pipe was experimented. 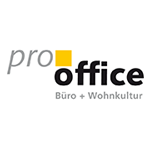 In an innovative and careful design process, the manufacturer in Frankenberg develops products such as the Thonet S 411, which are based on the thinking and tradition of Michael Thonet. Craftsmen, designers and a team of designers create successful and distinctive products of the highest craftsmanship. Thonet design stands for modern, timeless furniture and utmost comfort. The main focus of the development is the longevity of the products. A production-oriented and solution-oriented design process includes intelligent material selection, the use of resource-saving technology as well as the aesthetics and functionality. Thonet always strives to balance the protection of the environment, responsible action and profit-oriented growth. The manufacturer acts sustainably, holistically and with social prudence. The products are extremely durable and do not affect the environment either during disposal or during production. 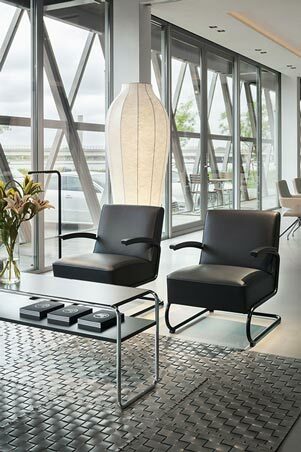 Related links to "Thonet armchair S 411, nappa leather"
Customer evaluation for "Thonet armchair S 411, nappa leather"